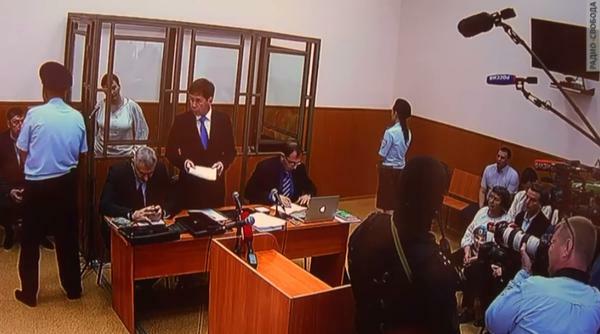 Nadiya Savchenko [in cage] in court giving testimony today with her 3 lawyers [centre] and mother Maria who travelled from Kyiv (bottom right). Today begins my final battle against the hypocrisy and lawlessness of the Russian authorities. The trial will not be honest and fair. In Russia this is not possible, here the court and investigators are puppets of the Kremlin. The battle will be to show the whole civilized and progressive world the truth about Russia and the crimes of its rulers. The final fight – is the hardest fight. Thank you to all of you, that you have remained and don’t abandon me, and Ukraine, in this battle which is not easy. Meanwhile, outside the court building, this brave woman was found in a (legal) solo picket of the trial. Her name is Yana Goncharova and she came to the Donetsk, Russia courtroom to support Nadiya from Rostov, Russia. This is extraordinary when you take into account that Rostov is the staging ground for recruit preparation before entering Ukraine for troop rotations in Russia’s invasion. 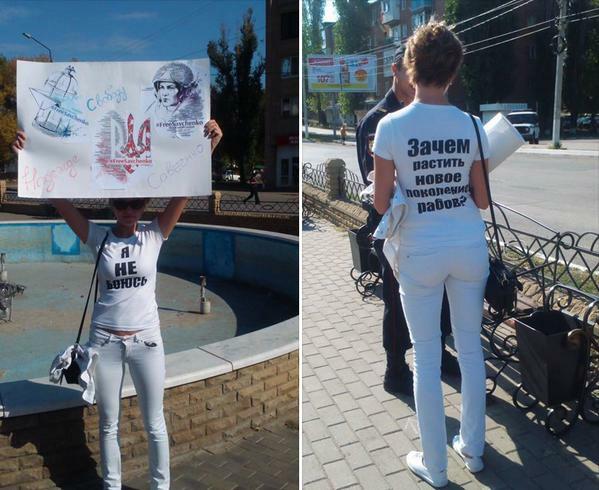 The front of her shirt says: “I’m not afraid.” The back says: “Why raise a new generation of slaves?” and she’s holding up a huge poster that says “Freedom for Nadiya Savchenko” with recognizable images of Nadiya by a well known Ukrainian artist. 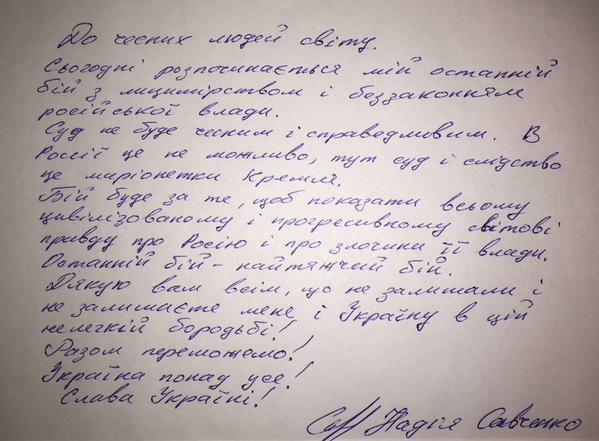 This entry was posted in #Free Savchenko, English, English News, Letters, War in Donbas and tagged #FreeSavchenko, #freesentsov, #Nadiya Savchenko, #RussiaInvadedUkraine, #StopRussianAggression, #UkraineUnderAttack, Human Rights, Ukraine. Bookmark the permalink.